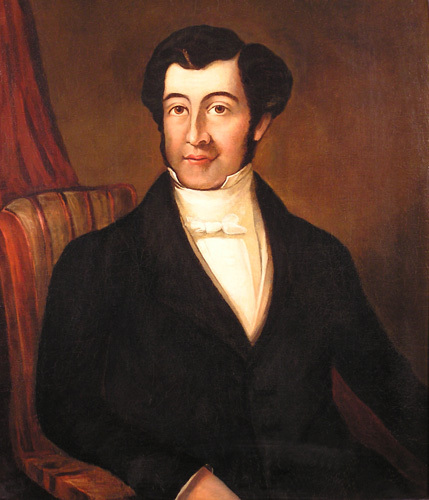 Joseph Bramah (1748-1815) was was an inventor and locksmith best known for having invented the hydraulic press. He had a workshop in Pimlico and employed Henry Maudslay, who went on to found a factory in Lambeth. Bramah was originally a Yorkshire ploughman but as a result of an accident he was forced to change professions and became a carpenter and cabinet-maker. His business included fitting water closets to a design by a Mr Allen. Bramah soon realised that the WC could be improved and in 1778 he patented his idea, then making further innovations to his WC with a water valve which he patented in 1783. The design of the Bramah WC was successful and made it particularly appropriate for use in ships. Bramah turned his attention to lock making, designing and patenting a new type of lock with (reputedly) 500 million possible variations in 1784. To advertise this lock Bramah placed a lock in the window with a sign offering £200 to the first person who could pick it. It was 67 years before it was successfully picked. The picker was a skilled American locksmith and it took him 51 hours of manipulation using a variety of elaborate instruments. Bramah needed machinery to make components for his business and this led him to employ Henry Maudslay. Maudslay was a genius at devising and making machinery and this was just what was needed to make the very delicate lock parts. Maudslay was quickly made Bramah’s foreman to the benefit of both. In 1785 Bramah patented a hydrostatic machine which led him on to develop his hydraulic press (patented 1795) as a viable proposition. The problem with the hydraulic press was that it needed a high pressure waterproof seal between the cylinder and the piston. Bramah tried various techniques to make the seal withstand the high pressure. He packed a coil made from hemp and leather in a recess in the neck of the piston. This was only partially effective and it was Maudslay who invented the self-tightening collar – a leather flap that fitted the recess. When pressure entered the cylinder, water got under the flap making it bellow out creating a watertight seal that became stronger as the pressure increased. As the pressure was relieved the flap retracted making it easy to move the piston back to the start position. Robert Stephenson used a single hydraulic press to hoist the gigantic (1,144-ton) tubes for his Britannia Bridge. Towards the end of his life Bramah set up a stone and timber works in Pimlico, using the machines he invented.